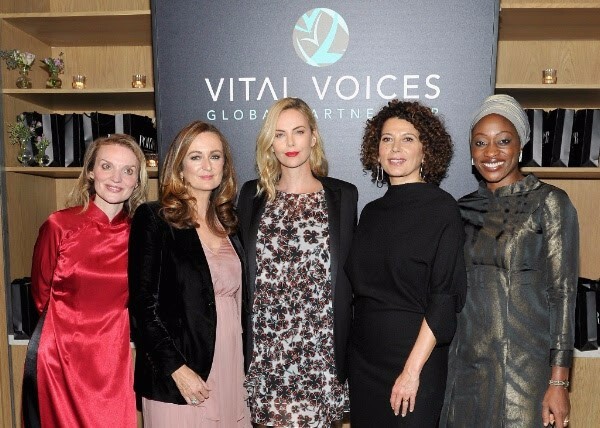 VITAL VOICES second annual Incredible Women Gala in association with Estée Lauder. Brie Larson and Kate Bosworth joined PORTER’s Editor-in-Chief, Lucy Yeomans and Universal Pictures Chairman and Vital Voices board memberDonna Langley as they co-hosted the second annual Incredible Women Gala in association with Estée Lauder. The evening benefitted Vital Voices, highlighting network activist, Hafsat Abiola. Hafsat Abiola-Costello believes the challenges facing Nigeria offer a unique opportunity for women’s leadership to emerge. Through her nonprofit – the Kudirat Initiative for Democracy (KIND) – she’s developing a rising generation of women leaders. Her life’s work is a tribute to her parents, who were assassinated for their pro-democracy activism. As a cabinet member of the Ogun State government, she works to keep communities safe and advance women’s equal rights. Long before Boko Haram made headlines, Hafsat took dangerous trips to areas targeted by the extremist group. She organized coalitions of women to demand action against the group and continues to advocate for justice.